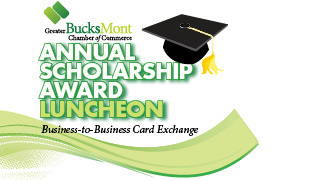 Each year The Greater BucksMont Chamber of Commerce awards scholarships funded by proceeds from the Annual Golf Outing to local high school seniors attending William Tennent High School, Archbishop Wood High School, and Middle Bucks Institute of Technology at our Annual Scholarship Luncheon. Please join us for a great day of golf and many other activities including a putting contest, hole-in-one contests, and team prizes. This annual event is a perfect way to entertain clients and meet new friends in an exciting setting. Sponsorship packages are available, which include recognition and business opportunities at the event. The event’s affordable entry fee of $150/golfer supports the youth of our local high schools. Register today! invite your friends & business associates! If you cannot attend our event, please consider making a donation. Your support is truly appreciated !